This Saturday (April 14, 2018), Durban is offered a unique artistic and religious experience – Monteverdi’s Mass for Four Voices sung by the Durban Chamber Choir and performed in the context of a sacred mass presided over by his Eminence Cardinal Wilfrid Fox Napier OFM at the Emmanuel Cathedral. “But at 17h30 in Emmanuel Cathedral on Saturday 14 April one of the highpoints of Renaissance music will be sung by the Durban Chamber Choir in a setting and context comparable to the one for which it was written almost 400 years ago. Monteverdi’s Mass for Four Voices was composed to be used as part of the services in St Mark’s Cathedral in Venice. Our own Emmanuel Cathedral – though not as ornate as St Mark’s – is just as imposing, also has a fine acoustic, and is similarly built on a reclaimed marsh. 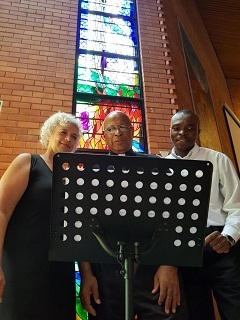 “Monteverdi’s music would have been sung during a Mass conducted entirely in Latin; the Mass that Cardinal Napier will be celebrating while the Durban Chamber Choir sings will have a lot more English. And we hope – unlike 1600s Venice – that Christians of all denominations and people of other faiths will feel welcome to come and experience this for themselves,” says Perrier. Claudio Giovanni Antonio Monteverdi was an Italian composer, choirmaster and string player who was equally at home composing and performing secular and sacred music. He is acknowledged as one of the pioneers of opera as an art form, and is known to help the transition from the musical period of the Renaissance to Baroque. His musical legacy includes nine books of madrigals, large scale sacred works and three complete operas. His works have enjoyed a rediscovery around the beginning of the twentieth century. He is now established both as a significant influence in European musical history and as a composer whose works are regularly performed and recorded. And since the Church, now as then, is committed not only to beautiful music but also to helping the poor, a collection will be taken for the Napier Centre for Healing: a new after-care facility for post-rehab addiction patients the centre will open in the Ekukhanyeni Mission not far from Verulam in the Iqadi region of the KZN North Coast. The drug rehabilitation centre will be the Cardinal’s legacy project. A building has been earmarked at the Ekukhanyeni Mission station not far from Verulam. The building has been repurposed and renovated, thanks to the generosity of a private donor. Additional funding and partner support is needed to get the centre up and running with the appropriate accommodation, staffing, resources and facilities. The Mass will take place at the Emmanuel Cathedral at 17h30 on Saturday afternoon as a fund raiser for The Napier Centre for Healing. Entry is free and all are welcome to the sun mass, however guests are invited to donate generously towards the Napier Centre for Healing, in lieu of buying a ticket. For more information, contact the Denis Hurley Centre on 031 301 2240. There is safe parking alongside the Cathedral.